Here's the lowdown on the project. 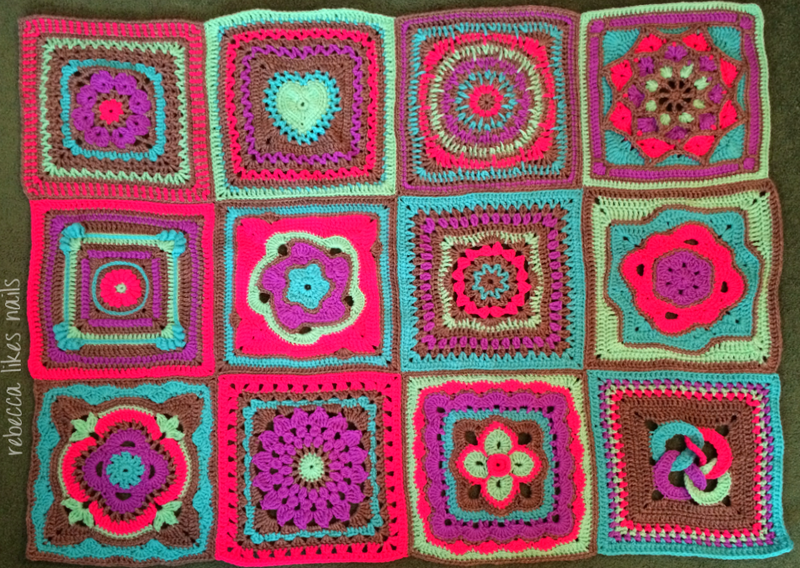 My friend Emma and I decided we would start making a "CAL afghan" (which can be short for either calendar or crochet-a-long) meaning that two or more people (often large groups like on the popular crochet/knit site Ravelry) choose squares for a blanket each month and at the end of a year you have an eclectic and fun blanket to be proud of! 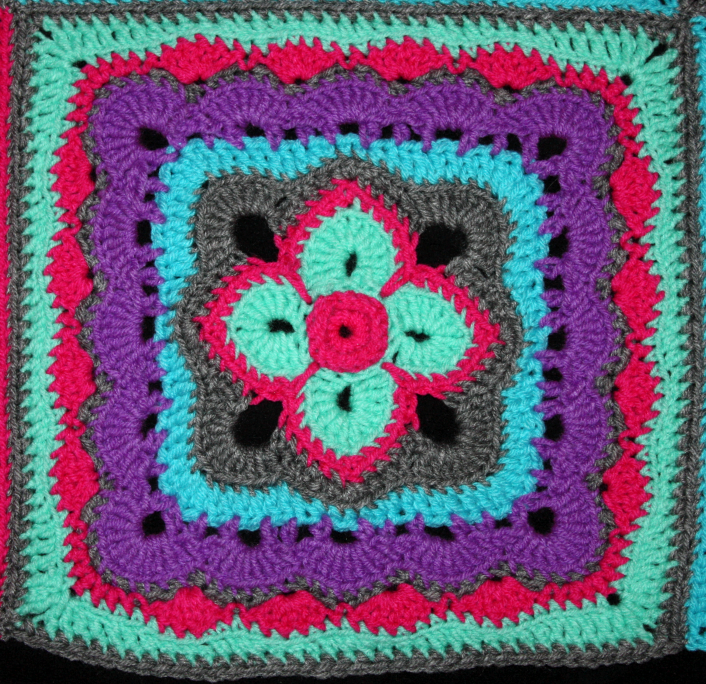 It's also a great way to tackle a blanket project because each month you only have to make one or two squares, and because each pattern is different, you don't get bored of making the same square over and over like you would for traditional afghan blankets. 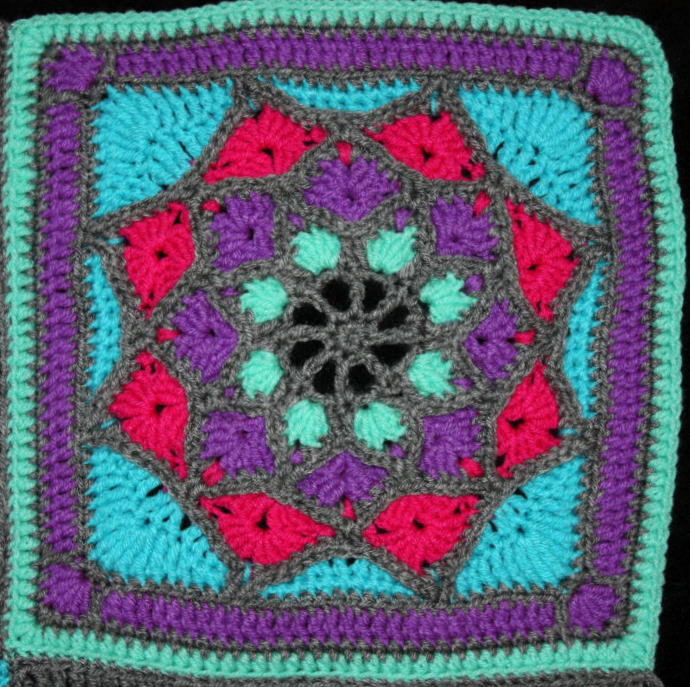 We decided that each month we would both pick a square (there are thousands of 12 inch square patterns available for free and for purchase all over the web) therefore making 24 squares in a year and a resulting blanket that would be 4 feet by 6 feet. A big cozy blanket! The blanket will have a special meaning for myself and Emma also because we have been making it every month since Emma moved to another province and we can't see each other without airplanes involved! So we are staying close with our crocheting. At the end of a year apart, we will each have a besties blanket. Much better than a lousy friendship bracelet. We are cute, right? So without further rambling, let's get into the squares and patterns. A lot of them require a Ravelry account to access the pattern but it's free to join! There are also some that we bought the patterns for, but in total we've only spent $5.99 so far. As you will have noticed from the first photo, I started putting the blanket together so unlike in my IG photos, the pieces are now part of a whole. The first block! 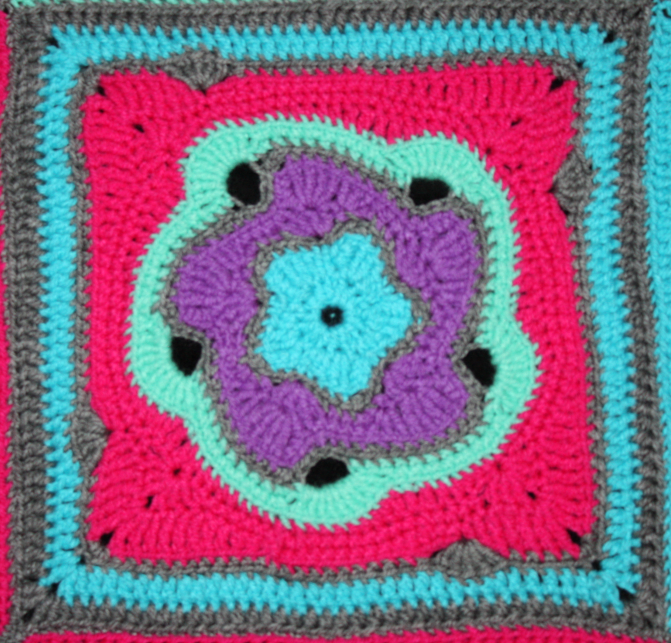 I crochet pretty tightly, so I had to add four rows of single crochet moss stitch to get the block to be 12". 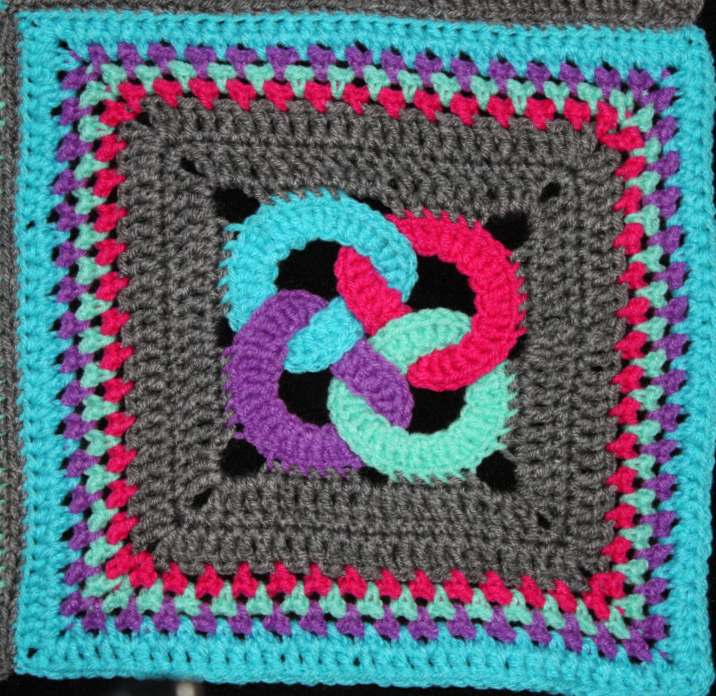 You may begin to notice that all the blocks I chose are gray on the outside edge, and the ones Emma chose are colored. That makes it easy to alternate between mine and hers in the final product. No gray edges touch, no colored edges touch. 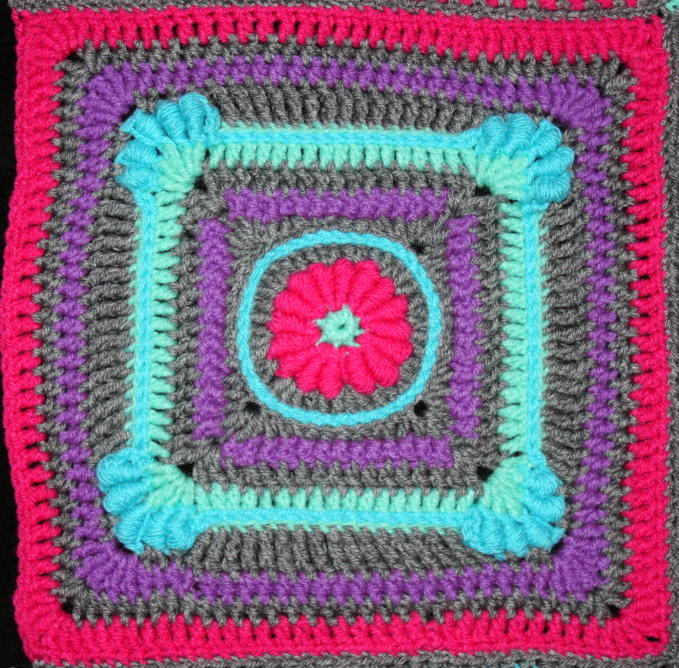 This square gave me a bit of a headache in that it really doesn't want to lie flat. It's wider through the middle than the edges. To try and solve that I added a row that has DC in the corners and 6 or 7 stitches from each side, with HDC in between those. That added more width at the corner edges to bring them out and make the whole thing more squared off. Nice and simple, works up quickly. 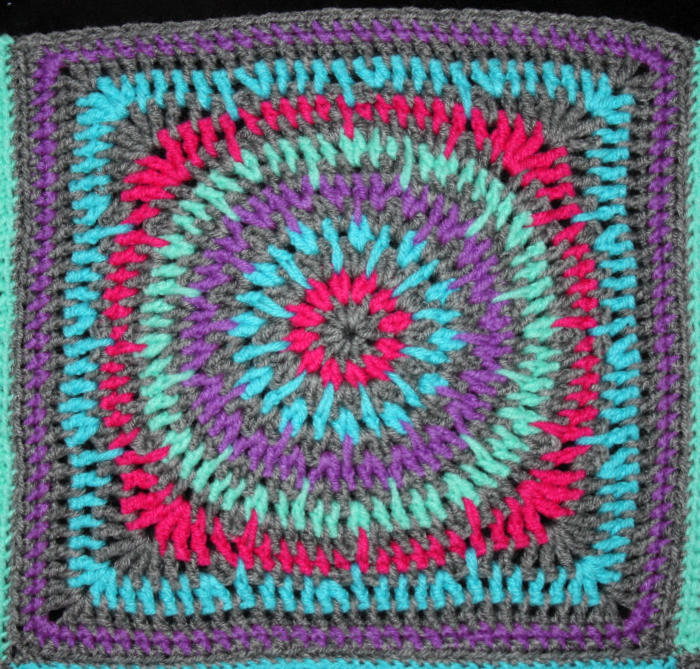 I believe I added two rows of single crochet to get it to 12". 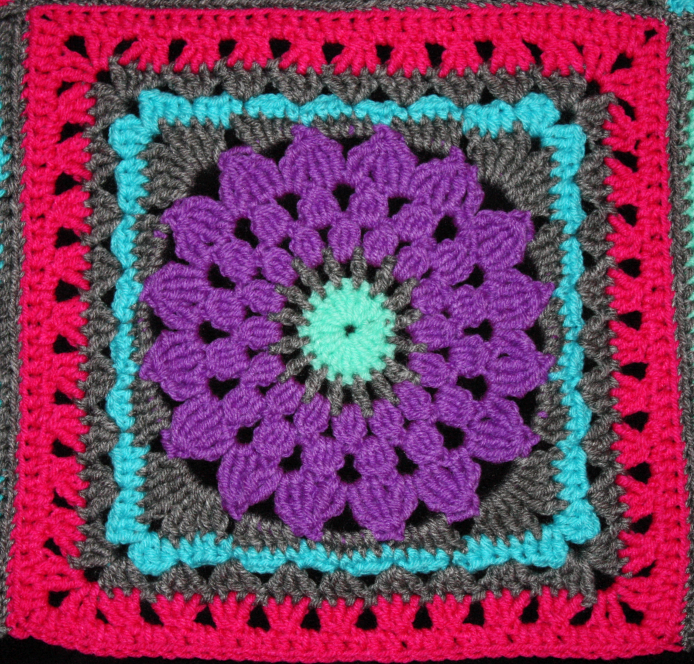 Everyone usually has to alter a square to fit their own crochet tension. $2 is a small price to pay for such a beautiful pattern! This one is maybe not the best for beginners, but not too hard. I totally wanna make this again with black like it shows in the pattern photos. Check out that full blanket with all the different colors! Nice. My pal Jacki from Adventures in Acetone liked my picture of this square so much that she recreated it on her nails! This pattern involves a stitch both Emma and I hadn't done before, the bullion. I'm not sure how I feel about them though, and I probably wouldn't choose a pattern with them again. This is the second block from the set I bought, using the 12" instructions. 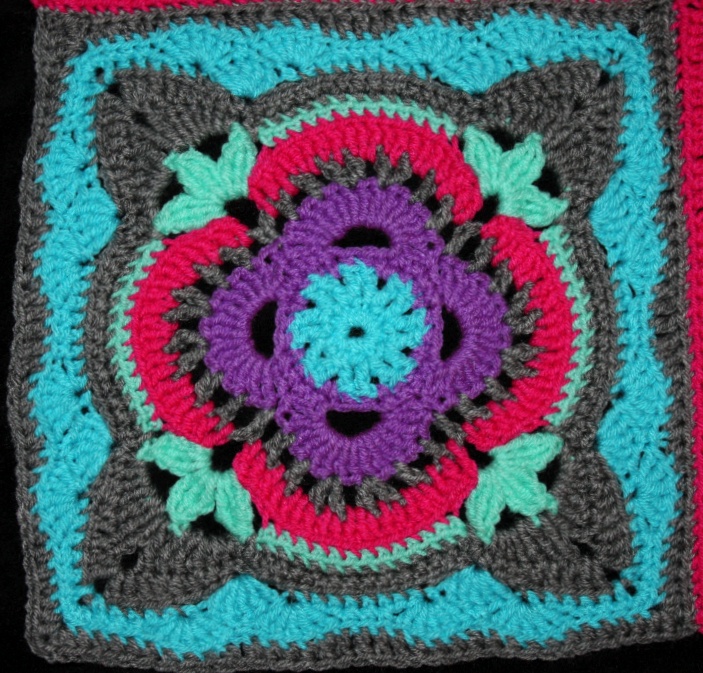 This block is fun to make because it it's really different, and again the pattern is well written. I like how each color is separated. This would make a fun blanket on its own! We did the 12" extended version of this pattern which is seen after the short version. Because of the way I placed my colors, I made it look less like a snowflake than the examples you can see in the pattern. I don't think I altered this one. I love this big flower! I'm happy that I made all the petals purple because I had been thinking of doing it multicolored. My final row was HDC instead of SC to get it just that little bit bigger. 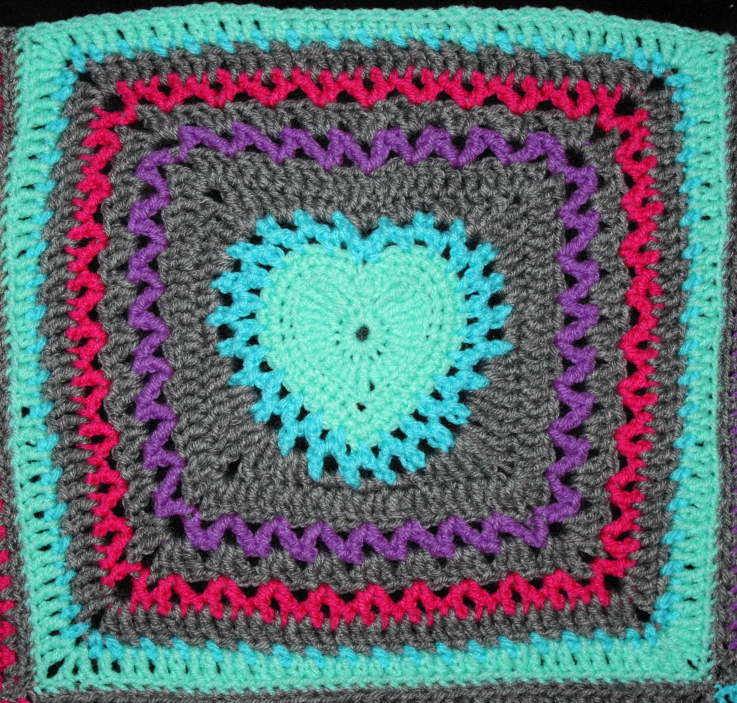 I think I will be making a full blanket with this pattern soon for a friend! This is the final block from the set of four that I bought. Again, I made the 12" version. The outer edge of the center of the flower is raised from the square. 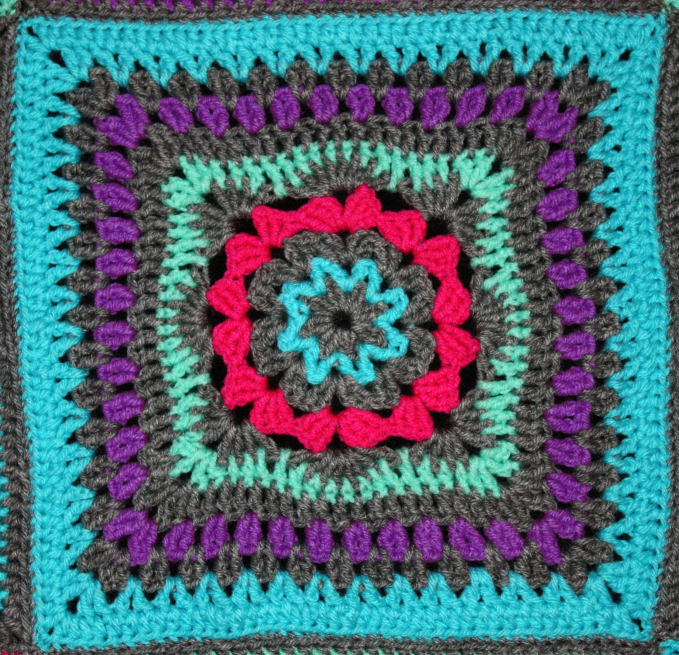 As with the others, this is a really wonderfully written pattern and enjoyable to create! This one is not as hard as it looks, but it is also not exactly for beginners. The rings are the tough part - the rest is simple. 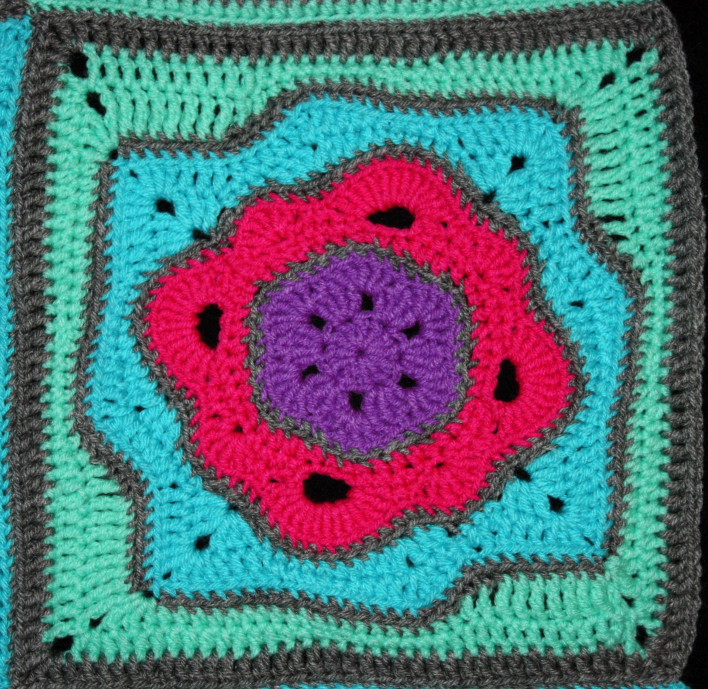 This square seems to be everyone's favorite! I believe I added another round of the scallops before doing the finishing round of double crochet. There you have it! I hope you enjoyed this post. Let me know if you wanna see more crochet in the future! To keep up with this project, be sure to follow me on Instagram where I will be posting the next squares as they happen (and actually April's are already posted.) Then when they're all done, another roundup post, with the finished product! There all so pretty! What cute looking designs on them too. These are adorable! I love the idea of different patterns in the same colours. 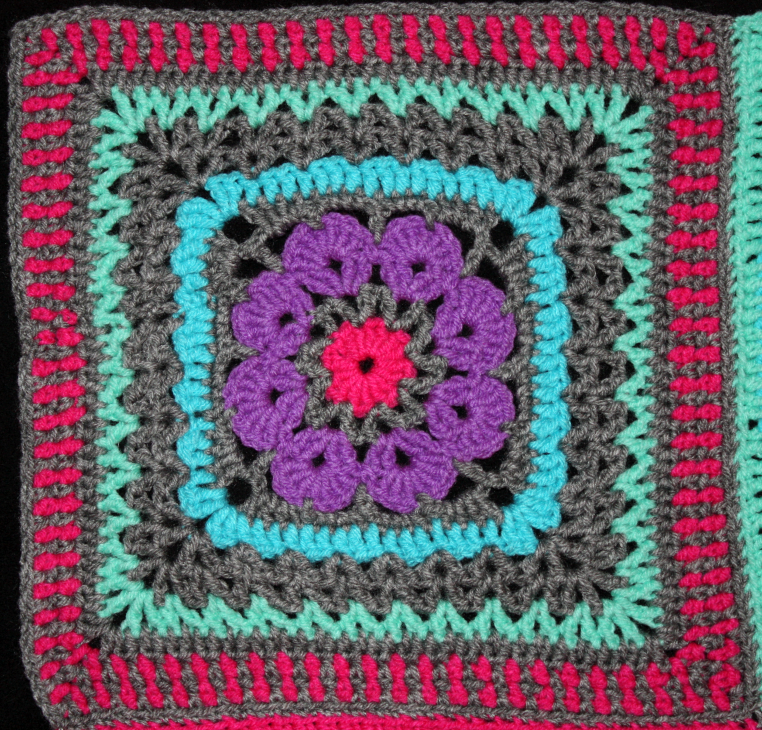 Your blanket is looking gorgeous! ive been watching your project on instagram and i love that i get to see it come together! This is seriously beautiful. I love the colors you've chosen. I started to learn to crochet for the first time last year with a simple stocking. I was amazed that I could actually do it! I've always been intimidated before. Seeing this makes me want to try more.